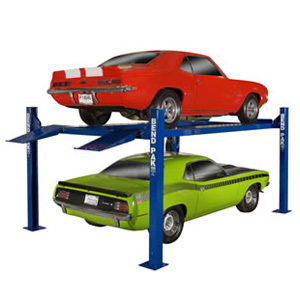 BendPak Lifts – Four Post Parking Lift – 18,000 lb. Lifting Capacity - Gary Bloom Sales, Inc. 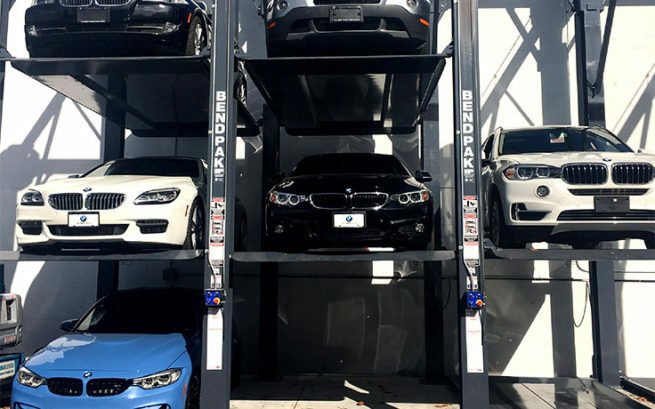 This ​parking lift is perfect for cars, light trucks and SUVs. A single unit can be modified to share columns with multiple units, thus safely reducing the number of columns you need to purchase or install. 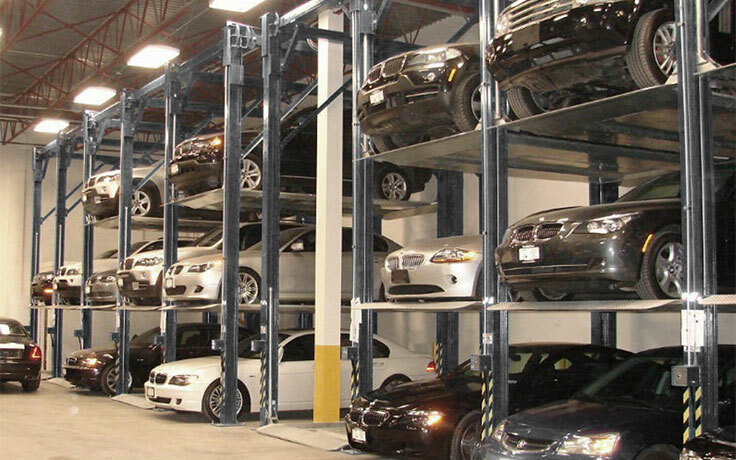 This setup is ideal for commercial garages looking to exponentially increase their parking space. Each of the three platforms supports 6,000 lbs.., and the structure utilizes both a hydraulic lifting cylinder and an aircraft-quality stainless steel cable system. The parking lift platforms are full-width and protect the vehicles beneath: no leaks or spills from above will affect the lower-level vehicles. 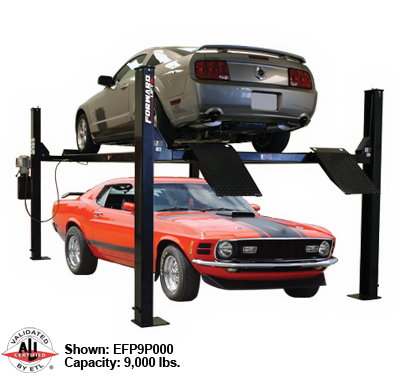 Just like BendPak’s other car lifts, automatic safety locks engage as the lift rises, and an ergonomically placed hydraulic power unit is easy to start or shut off on command. BendPak’s own leak-proof cylinder technology ensures our hydraulic system is maintenance-free for years to come. 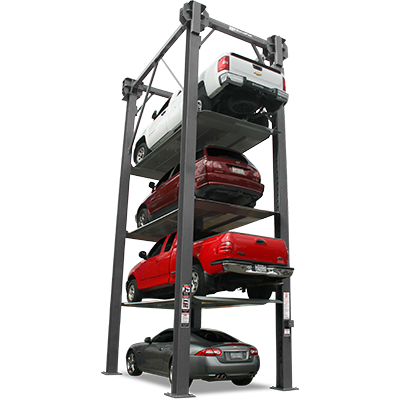 These state-of-the-art car lift systems are well-suited for commercial parking environments and are powered by independent electric-hydraulic pump units or a multi-unit power station pump system that can operate up to 10 lifts, depending on the configuration, layout and other technical factors. The PL-18000 can be configured for 208-230V, 380V or 440V operations and international voltage is available. Multi-unit pump systems require their own dedicated 3-phase power circuit. If you have a ceiling high enough for a triple-stacker, BendPak offers models with overall heights of 211″ / 235″ / 281″, and these lifts are fully customizable. 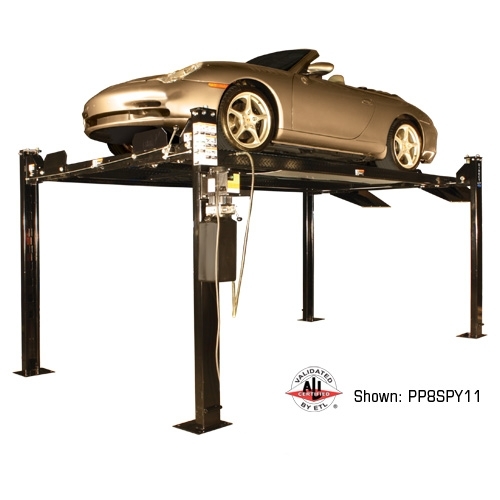 The PL-1​8000XL parking lift, for instance, comes with an extended frame, so limousines and other extended-length vehicles can be lifted with ease. Each model features a set of unique closeout legs that are available for purchase. 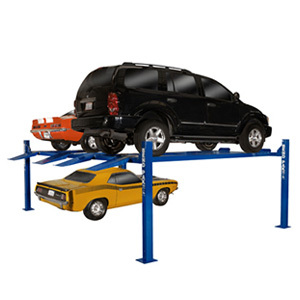 These ​parking lift sets are sold separately. *Not all BendPak lift models meet the standards as prescribed by ANSI/ALI ALCTV-2006 or ANSI/UL 201. Consult www.autolift.orgfor a complete list.